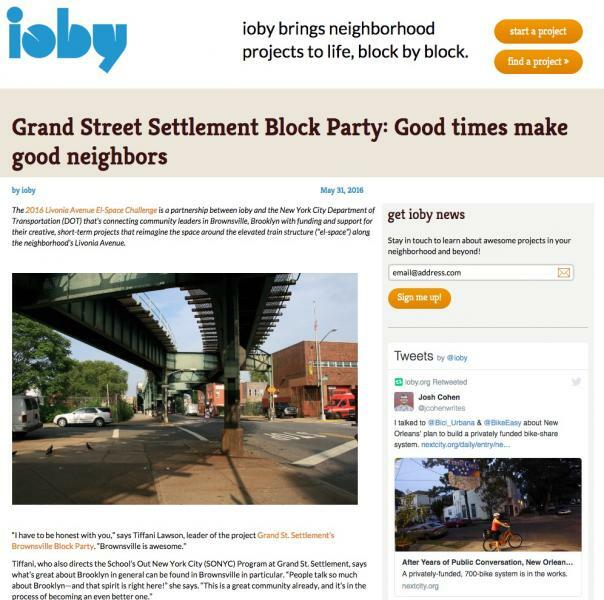 Grand St. Settlement will host a Block Party on with the goal of celebrating Brownsville and all of the new and exciting opportunities that are on the rise in this community. The Block Party will highlight the emerging Non Profits, Community Organizations, and all of the startups that currently exist in Brownsville. This Block Party will give these entities the opportunity to be at one location, pass out information about themselves and the services they offer, as well as meet and enjoy the community they serve. In return the residents of Brownsville will have the opportunity to do the same and learn more about services offered in their own community. -Pass along all fundraising information to GSS's Fundraising Department so that they can spread the word via Social Media. -Reach out to possible vendors to secure quotes. -Reach out to CBO's and local businesses to seek participation. -Promote the event locally and throughout all participating CBO's & Businesses interested in participating. -Work with DOT to secure all permits. Brownsville has historically been a community filled with pride yet at the same time has some of the most challenging and difficult obstacles to overcome in NYC. This is slowly changing with the influx of CBO's and local businesses bringing a new spirit of life and change to this community to help it's residents overcome the hardship that many of them have on a daily basis. We want to celebrate the community and bring all of it's residents together to gain insight on what's new to the community and have access to all of this in one location. We appreciate your support & kindness!!! Read the blog and support the project with your tax-deductible gift today! Thanks Felice for your donation of $5.